CCNA & Beyond CCNA changes v3.0 CCNA v3.0: Why you should not be scared! "The CCNA Routing and Switching exams and trainings are being revised from v2.0 to v3.0. Candidates can choose to take either the version 2.0 exams or version 3.0 exams. The last day to test for the 200-120 CCNA v2.0 and 100-101 ICND1 v2.0 exams will be August 20, 2016. The last day to test for the 200-101 ICND2 v2.0 exam will be September 24, 2016.". In this post we will look at the changes and what they mean to you, and how it will shape your certification studies! Firstly, don't be scared. This is annoying, and Cisco do this fairly regularly across all certification tracks, at all levels. They take things out, and add things, and this is to keep in-line with market trends, and making sure that the exams are relevant. We will break down each section and highlight what is new, and then cover what has disappeared afterwards. There is a large emphasis on network design in the CCNA v3.0. It's bringing in elements of the CCDA certification, which will actually make it easier if you decide to pursue that qualification. The key here is that we only need to describe them, not configure them. Probably a few hours of reading, and I'll do some blog posts about these. This is new and is all about Cisco embracing Cloud services, again, this is something they are doing across all of the certification tracks. We will look at these in separate posts. This is design-based, similar to the next section. As with 1.5, these are design considerations. We'll cover these in some blog posts. There are a number of different methodologies, but Cisco will probably favor their own approach. Stay tuned for a post on these. Overview: Not a huge change! Minor changes here (in what's been added), the biggest being the different types of access ports, and the inclusion of LLDP and the switch stacking and chassis aggregation. Much of this section remains unchanged, and the new bits will be covered here. Overview: Nothing to sweat over! Frame rewrite is new to the syllabus, and there are a couple of little bits added (routing protocol codes for example). The biggest change is that OSPF is no longer restricted to single areas, which is great! In CCNA and Beyond I actually cover multi-area OSPF already, because you need to know this. I was surprised that it was not on the v2.0 syllabus. In the book I explain how multi-area OSPF works, why single areas are easier, but not always suitable (especially in terms of scalability). I also cover redistribution, stub areas, virtual links and LSAs. Similarly with EIGRP I also cover redistribution, as it is something you should know as an engineer! I am surprised that RIP is included, but I cover that in the CCNA and Beyond study guide as well! Overview: Some new things here! MLPPP, GRE and WAN topologies, as well as the newer WAN access connectivity options. BGP is new to the syllabus, as is QoS. I have written books on BGP, MPLS, and different VPNs already, and also have a poll over on 802101.com to see how many people are interested in one on QoS (and Multicast), but will cover these here as well. These will be some full-scale labs, certainly for MPLS and BGP (QoS is a little harder to lab properly, at least what I call "properly"). If you are interested in something a little deeper, then check out BGP for Cisco networks, MPLS for Cisco networks, and VPNs and NAT for Cisco networks. They are on Amazon, and you will love them! Overview: Minor additions here. DNS, DHCP and HSRP were in the v2.0, but it looks like this is a little more focussed. 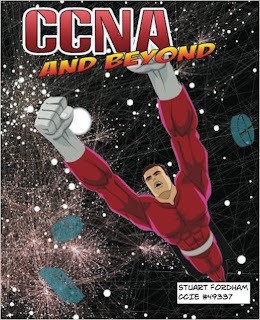 These topics are covered in the CCNA and Beyond book already. Overview: Section 6.2 is new, as is 6.4, and 6.6. 6.5 just adds a little extra. Section 6.5 is covered pretty well in CCNA and Beyond, and we do touch on AAA, TACACS+ and RADIUS. These will be covered in separate posts on here though. Overview: Some cool additions here! Nothing scary, mostly logical additions to existing topics. I covered IP SLA in my previous post (explaining why in a particular scenario, floating static routes and IP SLA were a better option than HSRP). Most of the core items are covered in CCNA and Beyond (it goes into the configuration register in great depth, as well as password recovery, device management, logging and so on). We will cover Local SPAN (and Remote SPAN because it makes sense to cover both), as well as LLDP in separate posts here. Network programmability will be covered over a series of posts. 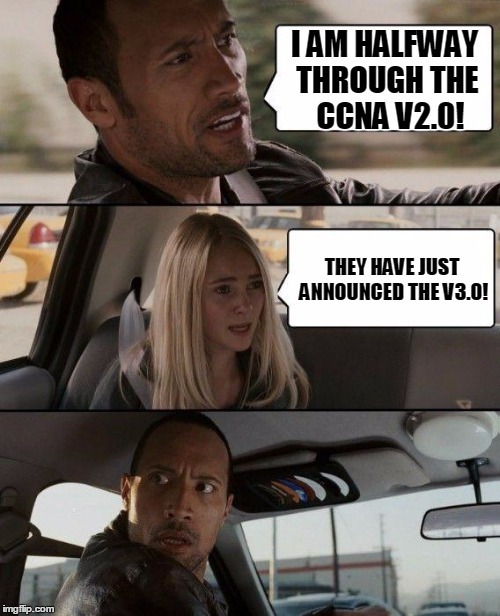 What's been removed from the CCNA v3.0? Most noticeably, Frame Relay has gone. I said (in CCNA and Beyond) that I would expect it to disappear at some stage and it looks like I was correct! Apart from that, not much has actually been removed. Some things have been simplified though. Most of the new things make a lot of sense, and the harder topics, such as QoS are "describe" only. It really looks like Cisco is trying to bridge some of the huge gap between the CCNA and the CCNP certification exams, which, believe me, is a good thing. Most importantly, don't worry too much. There is still time to sit the v2.0 exam(s) if you want, and we will cover ALL the new topics here, in a mixture of discussion and labs. If you sign up to the newsletter, you will get access to the members section of the forum. In there will be some cool stuff, by way of labs, downloadable memory sheets for the different topics, and whatever else I can think of, or that you would like to see. Many of the new topics (and more) are already covered in the CCNA and Beyond study guide, so do yourself a favor and grab it from Amazon! Awesome. I'm doing a boot camp next week. Getting rid of the old tech is great!